Lyle Is our Hollywood superstar. We were saddened to hear of the passing of Lyle. Though we only raised him for his first 4 months of life, the love Lyle had for everyone drew us together to create something bigger than us all. Our sympathies go out to you Lexi, his friends and family. Lyle could not have had a better life than the one he had with you. Thanks to his amazing mother Lexi Beerman, he has become famous and spoiled. Lyle loves to skateboard, snowboard, model and act. 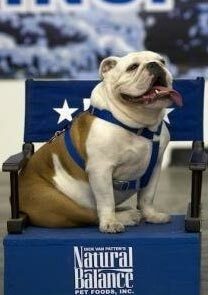 He joined his friends Tillman the orginal "Skateboarding Bulldog" and Rosie on the 2010 Natural Balance Rose Bowl Float snowboarding down the float. Lyle was also in the Winter Olympics 2010. He has also been seen on ESPN Sportscenter, ABC, NBC, Fox, People, TMZ and KTLA 5. Lyle even has his own website www.golyle.com.